Security Audit Systems provide penetration testing services using the latest 'real world' attack techniques, giving our clients the most in-depth and accurate information to help mitigate potential threats to their online assets. Security Audit Systems offer a range of website security testing services. This service provides a full website security check that will scan and test the entire website using a variety of attack method, ranging from MySQL/database attacks to DNS poisoning attacks. The purpose of all of our tests is for you to learn more about your websites security status, and gain intelligence into mitigating potential threats before harm is done. If your website is high profile and important to your business status, a website security audit is vital since websites now play a huge role in attracting clients to your business and potential customers want to feel safe while browsing or buying online. This service stamps your website with a ‘website security tested’ badge, that allows clients to feel secure and at the same time helps boost sales online. Website security testing should be part of any organisations risk assessment phase prior to launching live services. We take website security testing to the highest level, ensuring you can release your website knowing it has been extensively scrutinised by industry leaders. Security Audit Systems can provide scheduled monthly website penetration testing services to ensure your web presence is secured on an ongoing basis. Website security testing is done using ‘real world’, no previous knowledge attack techniques, which simulate a real hack attempt to gain access to your server or capture sensitive information. Security engineers will conduct a ‘fingerprint’ style analysis of your server and website pages using a unique tool set that actively audits every page, script or plugin for weaknesses. Our tools and website security scanners will get put to work, allowing us to quickly pick up website vulnerabilities that exist in your site. Once the website security scan phase has been completed we will perform a vulnerability assessment on your website frameworks manually for flaws. We will use our knowledge base and master the the structure of your website, identifying common CMS platforms until we know it inside out and at the same time looking for ways to get information that could prove useful in compromising the system. Using the information obtained from our reconnaissance, we will analyse the code for weaknesses or known vulnerabilities. This often involves using a variety of ‘fuzzing‘ suites and manual auditing practices done by our expert coders. At this stage we should have a good idea of how your website functions and will start to identify a catalog of vulnerabilities we can try to exploit to gain operating system or hosting environment access. After careful exploit selection, we will attempt to execute code against your website, and perhaps with a bit of modification and knowledge we will gain access. The final stage of the testing process will be to write up, document and present you with a website security testing (penetration testing) report, that you can understand, make use of and use to better secure your system. The report will contain solutions and bug fixes or information on how you may fix the vulnerabilities and advice on how to better protect your website in future. Why get a website security scan? Top reasons why you should get your website security scanned by our expert testers. We will find and locate vulnerabilities you may not be able to find yourself as we have years of experience when testing websites. Advice will be given through reporting on how you can ‘harden’ your website setup to prevent attacks in future. Getting your website security tested will increase your knowledge of how attacks are possible, and therefore how to defend against them. Through proactively checking your websites security, you will prevent attacks and increase the websites availability to your customers. Stored website confidential data will remain safe as the integrity of your site is upheld through continued website security scans. Experts predict a rise in security threats for 2017, check out the big brand predictions, here, here and here. Security Audit Systems offer a Continuous Protection Service (CPS). This service is for people who take security seriously and demand the very best in continuous protection. We offer our CPS clients regular vulnerability scans, and will proactively look out for problems that could cause serious security breaches against your website. This allows us to notify you and fix the security vulnerabilities prior to any of the ‘bad guys’ taking advantage of them. To get more information on our CPS solution, please contact us. To take advantage of our website security testing services get in contact with one of our security consultants today on the number below. Alternatively if you are looking for Penetration Test please visit our penetration testing page to understand how the service works and what we can offer your business. You may also like to take a look at our penetration testing tools if you have a greater understanding of security vulnerabilities. Looking for a website security company? Look no further and get in touch today to discuss your websites security requirements. 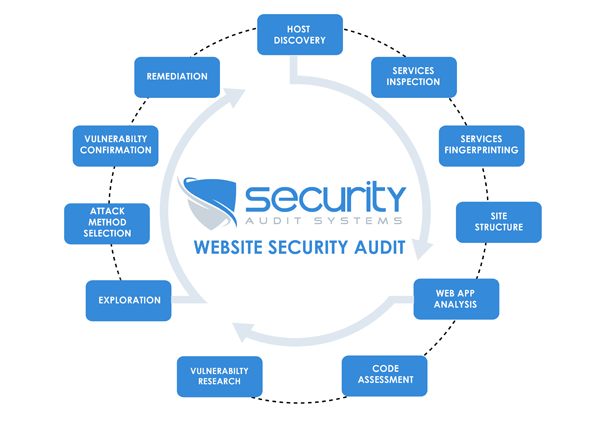 Security Audit Systems offer a variety of website security audits to suit different business requirements. If you would like a website security check or wish to learn more then feel free to contact us for further information about the service. Audit your website security today by calling Security Audit Systems on the number below to get a free consultation and quotation. A cyber-attack on a Norwegian aluminium company Hydro has cost it at least 300 million Norwegian kroner (£25.6m). More than £190,000 a day is lost in the UK by victims of cyber-crime, police statistics show.